“And here is my bedroom and my wardrobe.” With a sweeping motion Bill, our guide, opens the sliding door and gives free sight of his 250 shirts. We are on a historical tour around Raiatea, and Bill had stopped at his lovely house to show us around, although we had rather expected to have a look at the archeological artifacts he has collected over the last 30 years than at his socks and trousers. An anthropologist who has lived in Polynesia for a long time, Bill must have given fascinating insights into Polynesian culture and society in his “Almost Paradise Tours.” But he has turned 85 two weeks ago and his memory sometimes fails him now, which made it difficult for us to extract information from his pleasant chit-chat. According to legend, Raiatea is the centre of the Polynesian triangle between New Zealand, Hawaii and Easter Island, and all the founders of the other Polynesian empires came from here. 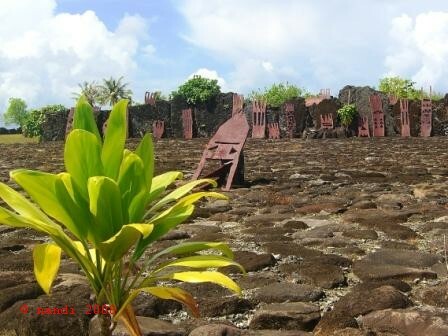 With Bill we visit several maraes, Polynesian ceremonial platforms, in the south of Raiatea. “Today people still come here to pray for important issues – look at those barn doors.” Bill points to the unu, wooden boards with engraved geometrical designs, which have been set up on the paved platform. “They used to belong to local chieftains, and their descendants have brought them here a few months ago to pray for a solution to the political stalemate,” Bill maintains. To us, they look like freshly wood-stained fretwork by a group of high-school students, and we wonder to what extent Bill incorporates legend into reality. “What are the fools doing? !” Rosina, the owner of the family pension on Bora Bora, spends the evening eating pickled sea-urchin and commenting in turns on the red wine she has been drinking to celebrate her recent or upcoming birthday, and on the heated debate in Parliament being shown on TV. “Gaston vs. Gaston,” proclaims the caption. French Polynesia’s multiple ex-president Gaston Flosse is just being ousted by his rival Gaston Tong Sang in a no-confidence motion. Tong Sang had won a majority of votes in the last election, but Flosse, a long-time manipulator in French Polynesian politics and staunchly against independence, variously accused of corruption and intimidation of prosecutors, had managed to get himself elected president again. His unlikely supporter was Oscar Temaru, the third on the merry-go-round of presidents in the past couple of years. Temaru is vehemently pro-independence and an archrival of Flosse. The prayers for political improvement seemed necessary indeed. “Many people around here are fed up with corruption.” Captain Rupati sighs as we stare at the blue sea and watch a small palm-fringed island pass by. And with Gaston Flosse, we gather. “Many of the big, expensive hotels have been standing empty for years.” Most of the profits from tourism do not stay in French Polynesia, he complains. The big hotel chains make sure that all the business they generate is on their own premises – bars, restaurants, tour operators, tattoo shops. Though the colony should have benefited greatly from French financial transfers (especially those related to French nuclear tests on two atolls in the Tuamoto island group), most islanders wonder where all that money has ended up. Small palm-thatched bungalows are standing on stilts about 60 cm over the water, linked by a wooden footpath. Beneath, the water of the lagoon shimmers in a tropical shade of turquoise. The small infinity-pool behind the beach bar is tiled in the same turquoise blue, and we realise that this is the standard colour of pools everywhere around the world. On the terrace, a group of elderly women is preparing for the “Mamas Show” at 7 pm. They are wearing ankle-length flowery dresses and flower wreaths around their head, neck and hips. The five dancers are accompanied by a small band of drums and ukuleles. One of the musicians, a gaunt grandmother with a stern face, does not sing like the others, and often stops playing altogether, staring morosely into the distance. With vigorous hip-shaking the dancers try to engage their small, moderately enthusiastic audience in the traditional Polynesian dances. Even Isa is compelled to a few steps on the terrace and gets a tiare wreath that will fill our room with a heavy sweet fragrance. After a demonstration of basket weaving the women march every obvious couple (i.e. everyone except us) on stage to wrap them in a flowery orange-yellow sheet, encouraging them to kiss. Apparently a variation of some kind of Polynesian marriage ceremony. “Oh, the diving is not overwhelming, but ok. And the job is a good opportunity to visit the different islands here,” Delphine from Southern France tells us. She has found work as a diving instructor and is happy to live on Bora-Bora for a couple of months. Bora-Bora, with its blue lagoon, the palms, and the overwater bungalows in the posh hotels, is like the stereotype of a South Sea paradise. It feels artificial and real at the same time, like strolling through a never-ending theme park. Paradise comes with a price tag, though: hotels, restaurants and tours a even more expensive than elsewhere in French Polynesia, and most tourists stay only for a few days in the picture postcard setting. From Bora-Bora we take the ferry over to Maupiti. 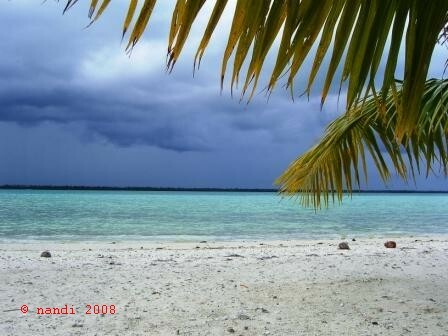 “Maupiti is like Bora-Bora 20 years ago,” several locals had assured us. And indeed sleepy Maupiti is lacking big chain hotels and tacky beach bars, and we never meet more than a handful of people on its one road, which circles the island. Gasoline for the motor boats is scarce, and the cheapest way to move to our campsite on an outlying spit of sand is to borrow a kayak, load it with our backpacks and wade through the shallow water of the lagoon, the kayak between us. Here, on Motu Auira there is nothing more than sandy beach, a lot of coconut palms, and some scattered houses with their own wind generators and solar panels. Right in front of our tent, swarms of tropical fish crowd around the corals in the lagoon. The water is so clear that Natascha can look at them from above, without taking her glasses off (and thus actually see them!). We spend most of our days in wet swim wear, snorkelling mask at hand, lazily fighting off the mosquitoes – and feeling Robinsonesque. In between respites, we practice sea kayaking and opening coconuts with a meat cleaver. Although we have always considered ourselves as mountain persons, to our surprise we are discovering our beach person side.